S’mores are one of my favorite things. Who doesn’t love melty chocolate with charred marshmallows that are soft and ooey-gooey? Honestly, I can leave the graham crackers behind, but I suppose you have to have something to hold the chocolate and marshmallow. 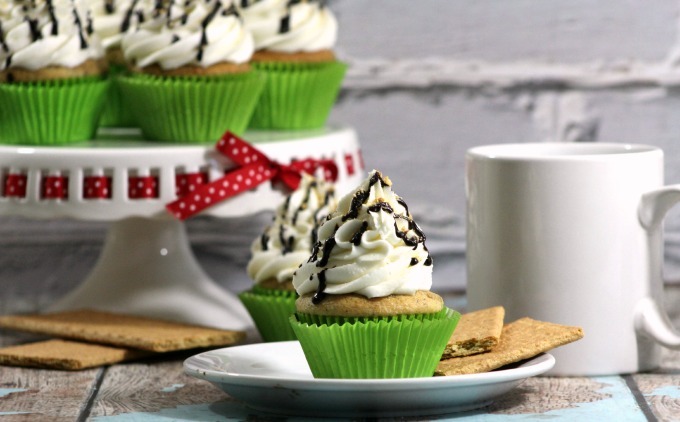 I’m alsways looking to indulge in s’mores in any way, shape or form, so I’m all about these Smores Cupcakes. The cake for the Smores Cupcakes is a little coffee-ish, a little almond-y, and has that graham cracker feel. 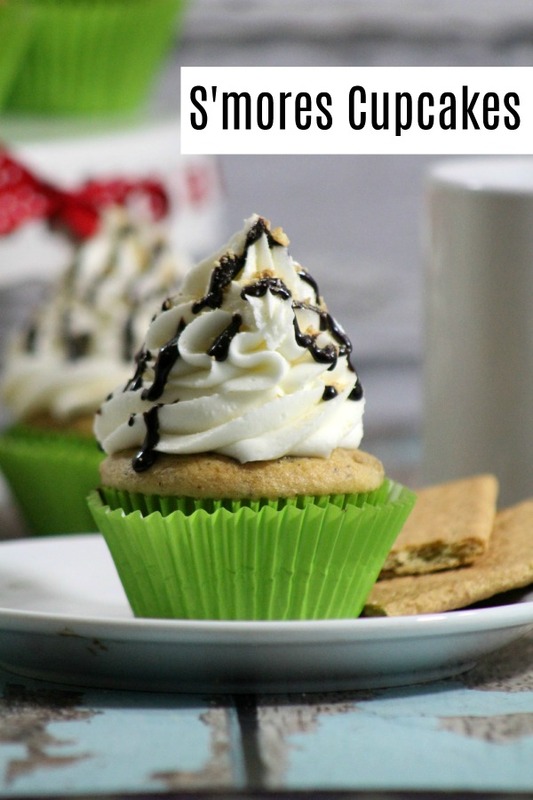 I am all kinds of in love with the Starbucks S’mores frappuccino, and this cupcake is the perfect match to it, for when you want a cakey treat. Now, I am in no way condoning having these two things together, as it’s kind of sweetness overload. But ya can, because it’s your life. This cupcake recipe is made from scratch, not a mix. Yes, you too can bake from scratch. It’s not difficult, and you’ll find that once you get comfortable, there’s no stopping you. Using a stand mixer, beat the egg whites until foamy. Add 1/2 C sugar to the egg whites and continue to beat until soft peaks form. Alternate slowly adding the flour and milk to the creamed butter, and mix after each addition. Add the vanilla, coffee and the almond extract to the flour butter mixture. Add the fresh coffee grounds. Mix well to combine. Fill the paper lined cupcake tins 3/4 full. Bake at 350 degrees for 20-25 minutes or until a toothpick inserted comes out clean. Cream the butter and powdered sugar until light and fluffy. If doesn't cream add the heavy whipping cream. Be patient as this takes a while. Continue to beat to make sure the frosting can form and keep a stiff peak. Be patient. Did I say that yet? If your frosting can't or won't form and hold a stiff peak add more powdered sugar 1/2 C at a time. Add the marshmallow extract. Mix well to thoroughly combine all ingredients. Make sure that the frosting can form and hold a stiff peak. Scoop the frosting into a pastry bag with a large tip.Alternatively, you can use a large ziptop bag with the corner cut off and a tip pushed through the corner. Drizzle the frosted cupcakes with chocolate sauce. Placing a graham cracker into a ziplock bag use a rolling pin to crush the graham cracker into crumbs. Sprinkle the graham cracker crumbs over the top of the frosted cupcake.